Producing high quality carbon fiber composites takes a lot of skill and experience and the proper design. Special techniques and a lot of labour goes into the production of each money clip. We believe you cannot find an equal or better quality money clip anywhere else for any price. We back this up with our 90 day money back guarantee! 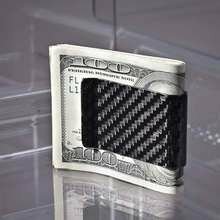 Going on 5 years with my Carbon Fiber money clip. Still rock solid. Assuming it ever wears out, I'll immediately buy another!